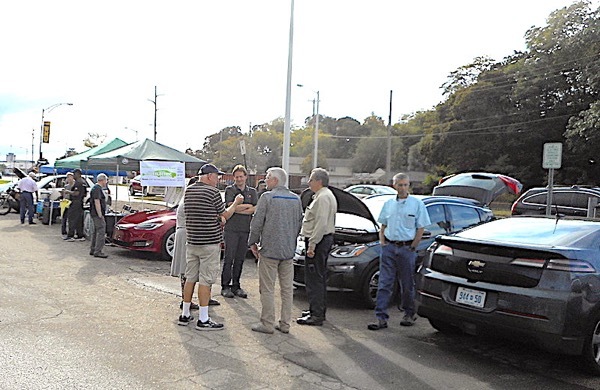 About twice as many EVs and twice as many interested people flocked to this year's Kalamazoo drive-and-ride as we had for our first event in 2015. 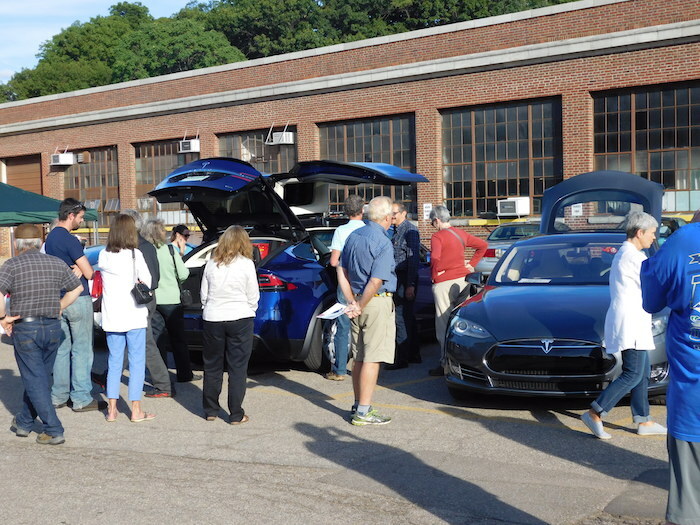 We also branched out this year, answering calls from folks in Hastings and South Haven to come show them what this growing electric-car excitement is all about. The news media is taking notice, too! A few days before we kicked off National Drive Electric Week with our drive-and-ride in Hastings, Rebecca Thiele of WMUK radio interviewed Ben Brown. Then Jim France of South Haven appeared with Ben on WWMT Newschannel 3's Lori Moore Show. At our drive-and-ride next to Waldo Stadium in Kalamazoo on Wednesday, Ben got interviewed again. So did Mike Walenga of the Kalamazoo Electric Vehicle Association. Special thanks to Barbara Haywood at the Hastings Library and to Jim France at the South Haven Library for inviting us and for doing such a fantastic job organizing and publicizing! Thanks also to Western Michigan University's Office for Sustainabilty for their help in promoting our work. 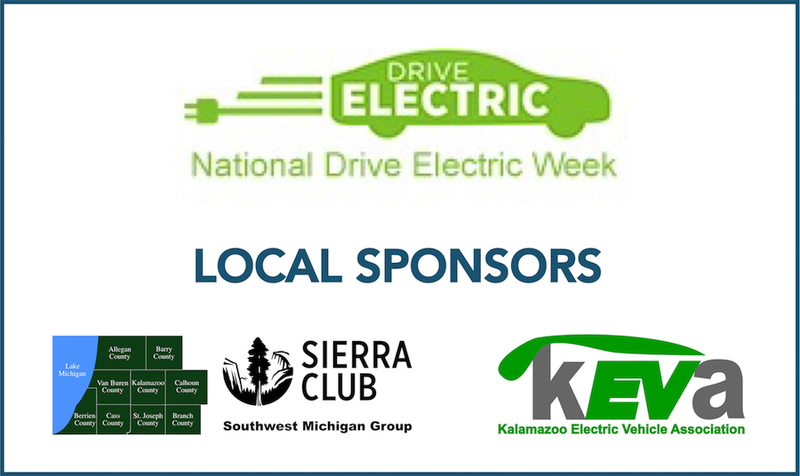 Sierra Club Southwest Michigan Group and Kalamazoo Electric Vehicle Association will celebrate National Drive Electric Week 2017 with three big Southwest Michigan events September 9, 11, and 13. 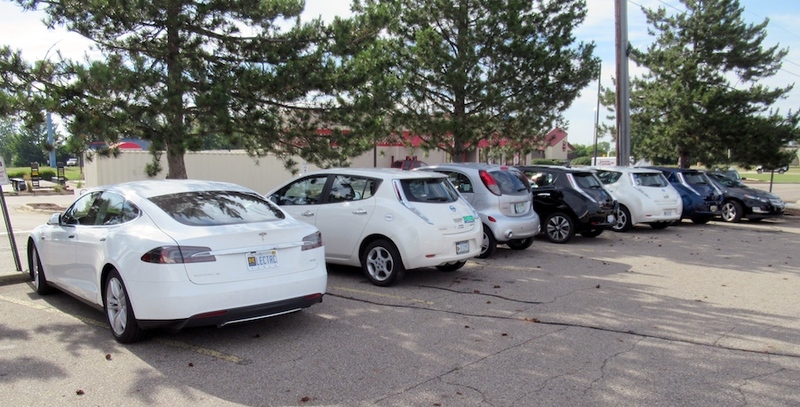 Be in Kalamazoo Wednesday evening, September 13, to see why the whole wide world is joining the inevitable transition from gasoline-powered transportation to electric. If you haven't been plugging your car in and driving on electricity instead of gasoline, you're paying way too much for fuel and for routine maintenance. And you're missing out on all the clean, quiet power. And you're not having enough fun! Electric car owners are treating the planet and themselves better! Join us at 5:00 PM Wednesday evening, September 13, at Western Michigan University's physical plant parking lot, 425 Stadium Drive, next to Waldo Stadium. Learn why electric cars are right for the planet and right for you, and take a FREE DEMONSTRATION RIDE! If you can't be in Kalamazoo on the evening of Wednesday the 13th, maybe you can make it to one of our other celebrations. Our special presentation Monday, September 11, 5:00 PM, at South Haven Memorial Library, 314 Broadway, will explain why electric car ownership makes sense for you. Then we'll treat you to FREE highway-capable electric vehicle demonstration rides leaving from the South Haven Farmers' Market parking lot next to the library. Registered attendees report 556,209 electric miles driven.